Hello my lovelies ♥ I hope you're all doing great! Today I came across something so beautiful and inspiring (it even brought a few tears to my eyes) and I just had to share this with you all. Below is a picture of Maya, the beautiful daughter of @dehappy5_mama on Instagram. Ullenka (the happy mama! ), her husband and their three kids have been following a raw high carb low fat vegan diet for the last 6 months and have experienced some truly remarkable results. Maya had previously suffered from severe eczema as well as leaky gut caused by candida overgrowth. After only a few months, Maya is completely healed and is looking absolutely gorgeous and healthy. This before and after made me somewhat emotional today and really tugged on my heart strings. As you may know, I've had my own on and off struggles with my skin, and I've seen plenty of dermatologists over the years. During every consultation, I'd ask them about diet and if it's related to my skin issues. I'd ask them if there are any foods I should be avoiding, or foods that may be disrupting my hormones (thus causing the acne). I'd ask them if the health of my digestive system could be linked to acne, or if stress / exercise had any impacts. Every doctor looked at me with a smile and said no, acne is caused due to bacterial growth on the skin and diet / lifestyle habits has no impact. Then they were always more than happy to prescribe me an antibacterial cream, face cleansers and medicines. It just never felt right. I was so happy when I discovered this lifestyle and read about all the positive transformations from people healing themselves of all sorts of diseases and health complications. This lifestyle is so empowering and set us free from the never ending cycle of pharmaceuticals and medicated treatments. "Let food be thy medicine, and medicine by thy food" - Hippocrates. Follow @dehappy5_mama on Instagram here and check out her blog here! This information is so important, and should be celebrated :) There are so many of us dealing with health issues which can be totally reversed and cured through a plant based, high raw (or fully raw) high carb, low fat, vegan diet. 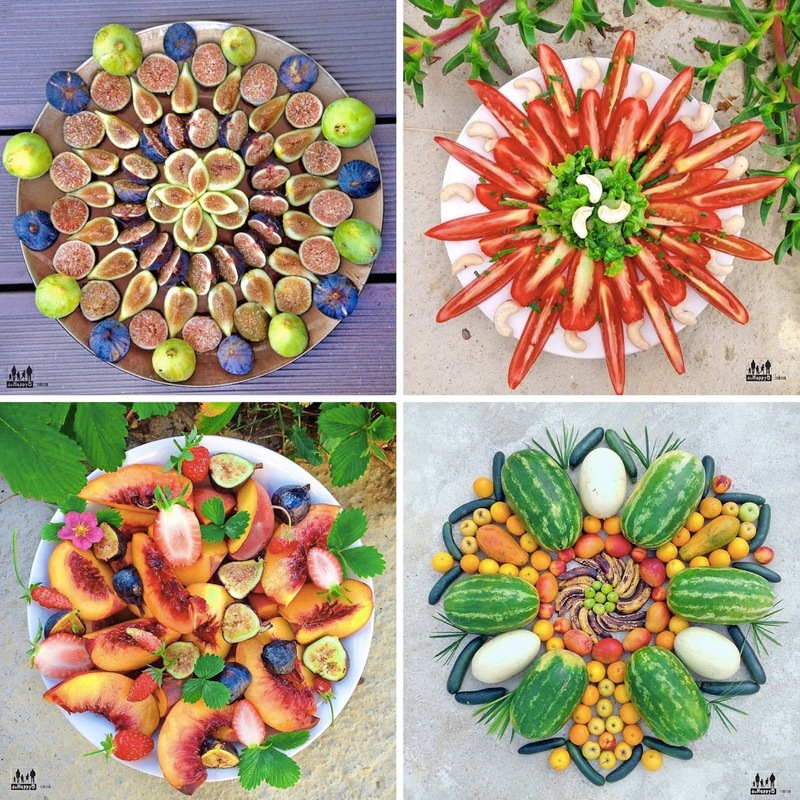 And most amazingly, the answer is so delicious, colorful and satisfying! I'm so thankful to Ullenka for sharing her truly inspiring journey with us. Thanks for sharing (I do not use Instagram) - food has amazing power - to heal or make us sick - choose well & you will be rewarded beyond measure. Thanks for sharing this! It's truly amazing! what diet was sweet Maya on, before this wonderful change..? Thank u so much for sharing! I´m a 16 year old girl with the same problem as maya. I have had eczema since I was a little kid and I also have a leaky gut caused by candida overgrowth. I just got rid of all the candida and I got so much of my energy back. I also eat a lot of vegan food and I'm much better now. After reading this it really inspires me to try the same diet. I wish u and your family the best. Hugs and love from Norway. urs is a really amazing journey. we at india our elders still prescribes us more food alterations such as using turmeric, changing diet and even make us go for fasting for quick recovery of ill healths rather to go for a doctor for every unnecessary minor issues. Wow, this is awesome. I suffer from eczema as well, but not as severe, and understand how difficult it can be do deal with and make you feel. Since I have eaten cleaner (for the most part) I have also noticed a major improvement in my skin. I don't think I'd be able to go full raw vegan quite yet, but I know how beneficial it is to put good clean food into the body is. Thanks for sharing this wonderful story! This is truly amazing. 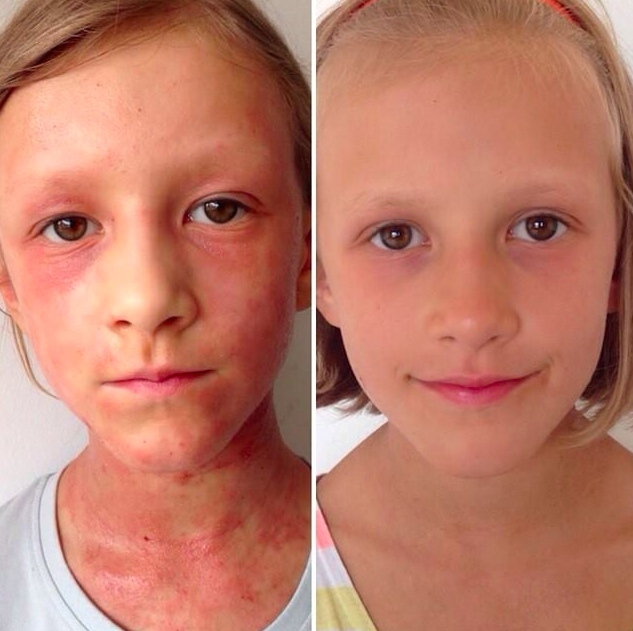 I am so happy for your daughter who is now able to live without the pain and heartache of eczema. Our food really can harm or heal us. I had the same experience with my 3 year old daughter after going through the "specialist" for 2.5 years at the hospital and being on three medications 2-3 times a day we decided enough was enough and took matters into our own hands. We went back 6 months later to show them and they said oh she just grew out of it, when we told them we had gone basically vegan they almost had seizures on the spot. Three years on she is healthy and happy we eat about 50-75% raw you dont need to eat completely raw in fact I don't believe that it is achievable to eat completely raw long term. High Carb, loads of fruit and healing foods such as ripe bananas and dates, low fat, dairy and gluten free and very very limited meat (or fish), we have fish every 1-2 weeks in a small portion. You will be amazed how smart your kids are on this diet both our 7 and 5 year old are well ahead of the rest of their class mates in almost every area. Can you tell me some examples of what you make for "dinner" on this type of diet? I wrote my story below. My daughter 12 and still looks like Maya. I am going to go this route and hopefully clean her up! This is absolutely amazing! My sister suffered from eczema for many years during her childhood. She was even in a hospital because of it. I wish we knew about raw food when she suffered. This is great proof for people who say that raw food is something stupid, unnatural, unhealthy... As I have heard many times. I wish all the best to Maya! Thats pretty awesome stuff. Can you please explain what all is included in raw vegan food? I wanna start it all. As I am new to this concept please tell me where can I find all the proper info regarding eating raw. Watch Annie's video on youtube! And be sure to check Freeleethebanangirl on youtube. Lot of information on eating raw. Could you please tell me the detox-method she used that you think is the best? Wow! What an inspiration! Amazing what food can do with our body. I finally started to eat vegan. Till now I think it is a really great adavanture. I'm getting to know my body from a unknown side. And I really start loving myself. I wanted to share this with you.. I found this Girl doing really cool videos on YT you should really check it out. thanks for beeing such an incredible inspiration. You really help me to go with what I am. And seeing my life the way it is! And especially I DO NOT FEEL alone. Alone with those feelings about food and my body about beeing a deep thinking person. Could you do more vids. on which you do breaky ideas or dinner? Thanks. Feeling very emotional too. I have also struggled with eczema and have had several severe episodes in the past. Aside from the physical issues, the mental issues can be deeply scarring too. This is a beautiful and important story to share as I'm sure it will give hope to many who suffer in silence and fear. Dear Annie, after being very very skeptical about your vegan journey and being discouraged by my "paleo" views and the common misconception that "you need calcium from milk" and "protein from meat" I decided to listen a bit and started by watching Food Inc and Earthlings. Earthlings simply brought me to tears that I couldn't stop no matter how hard I tried. And then it hit me "How can we be healthy if we eat these poor animals that suffered all their lives and had a traumatic death?". It just can't be. All their energy and their fear is still there. I admit, I'm still a bit afraid to start a vegan journey but I'll give it a try. After all, I tried all kinds of stuff in the last years and I didn't die. And for sure I'm not getting my calcium from my daily bar of Snickers. So, even if it doesn't work, I have nothing to lose. I've been struggling with hormonal acne for 4 years now but I'll always look for a cure. And I want to admit something else, at some point when everybody criticized you on your detox phase, I also thought that you're ruining your health and will regret it. But today I see you close to being clear and more beautiful and energetic than ever. Thanks for inspiring me with your strength and courage! I would have never done it without seeing your results! I'm very happy for you and I hope I will be able to be happy for myself too! And for my ex paleo buddies, don't listen to what the commercial version of the diet became! Remember Kitava! I began a vegan journey a little over two years ago and have pretty well remained vegan. My vegan journey began due to some health issues and it has changed my life. I'm excited for you even though I don't know you. But I do know what it feels like to walk a road that everyone thinks you are nuts for trudging. Good luck. Thank you so much for sharing. My kids have terrible skin, allergy, and asthma problems. We have tried everything. My poor 1 year old scratches all night long. I wonder if this could help him. that is a great result. My daughter is using digestive enzyme to get rid of the yeast infections and change milk to almond milk. Also use good skin care regimen to solve her skin problem. This is an incredible story and it really gives us information to keep in mind! Thanks so much for sharing it! I have extreme eczema on my hands on one of my feet. It's painful and very uncomfortable. I've been seeing Kaiser's dermatologists since I was a child - I'm 55 years old now - and they've done not one single thing to heal me. I appreciate this post and will be trying out the high carb low calorie vegan diet. Every one of the additives, added substances and lethal chemicals are still there and might add to a considerable lot of the manifestations you are wanting to stop and control.